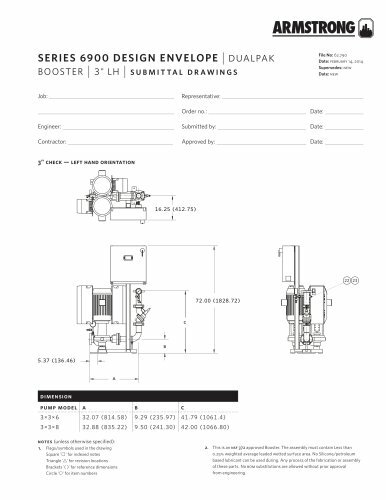 booster dualpak SUBMITTAL DRAWINGS File No: 62.790 Date: February 14, 2014 Supersedes: new Date: new Date: Date: Date: 3" check — left hand orientation notes (unless otherwise specified): 1. Flags/symbols used in the drawing Square for indexed notes Triangle 'A' for revision locations Brackets '( )' for reference dimensions Circle 'O' for item numbers This is an nsf 372 approved Booster. The assembly must contain Less than 0.25% weighted average leaded wetted surface area. No Silicone/petroleum based lubricant can be used during. Any process of the fabrication or assembly of these parts. No bom substitutions are allowed without prior approval from engineering.